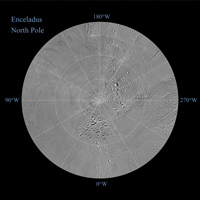 The northern and southern hemispheres of Enceladus are seen in these polar stereographic maps, mosaicked from the best-available Cassini clear-filter images. Each map is centered on one of the poles and surface coverage extends to the equator. Grid lines show latitude and longitude in 30-degree increments. The scale in the full-size versions of these maps is 360 feet (110 meters) per pixel. These maps are updated versions of those released in February 2010 (see (see PIA12565 and PIA12566).